Are you looking for more interesting German Shepherd Facts? Then you're in the right place and we have several pieces of interesting German Shepherd trivia for you below. So let's get started. The Alsatian (AKA: German Shepherd) can be dated back to a starting date of about 1899. The first registered German Shepherd was a dog called Horand von Grafrath, originally named Hektor. The average German Shepherd Dog litter size is 8 puppies and they can often live to an average age of about 13 years in age. The average German Shepherd Dog male stands 24 to 26 inches in height and weighs between 80 to 100 pounds. Female German Shepherd Dog typically stand between 22 to 24 inches in height and weigh between 70 to 80 pounds. These are a double coated dog breed with a medium length, straight outer coat and a fluffy, downy undercoat that is usually shed at least once a year. They come in 3 basic coat lengths: Short-coated German Shepherds, Plush Coat German Shepherds and Long Coated German Shepherds. 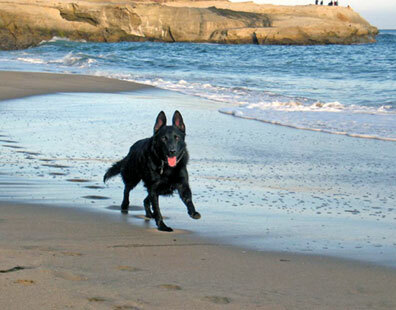 Stanley Coren, the author of "The Intelligence of Dogs," ranked the German Shepherd as the the third most intelligent breed of dog, right behind the Border Collie and Poodle. Because of their intense intelligence, athleticism, loyalty, obedience and working ability, the German Shepherd is often used by the police, military, service dogs, and search and rescue operations. Based on litter and individual dog registrations globally, the German Shepherd Dog is consistently one of the most popular breeds of dog in the world. In the early 1920's, a German Shepherd Dog named Strongheart was one of the first canine silent movie film stars. His popularity paved the way for Rin Tin Tin later on.